Wow, you can tell it's been a long time since I used this graphic, huh? It has the old domain on it! Goodness gracious, I'm going to have to do something about that. I wonder if I still have any sort of software. Probably not! No worries though. This is a minor thing in the story of life. 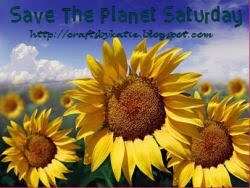 Now...on with the proper Save the Planet Saturday post! One of the things that the boys and I are doing this year is putting in a fairly good sized container garden. We're growing all sorts of things and while they're not as excited as I am, it really is a great family project. The boys each have a plant of their own and once summer rolls around, it will be their responsibility to care for it. If you've ever planted a container garden, you'll know that it takes a few things to make it happen: containers, seeds and a lot of dirt. Did I mention a lot of dirt? To be honest, I've lost track of how many bags of topsoil and garden soil we've purchased this year and we're not close to done yet. I don't even want to imagine how much money we've spent or how much money, etc went into getting that dirt to a location where I could purchase it. Some of you may be thinking... but it's just dirt. How much could that affect the environment? Well, how about the plastic bags that it's all packaged in? The cost, not just in money but emissions, for transporting it to the various stores? Plus other things that I won't take the time to mention. Step 1: Collect up your supplies. 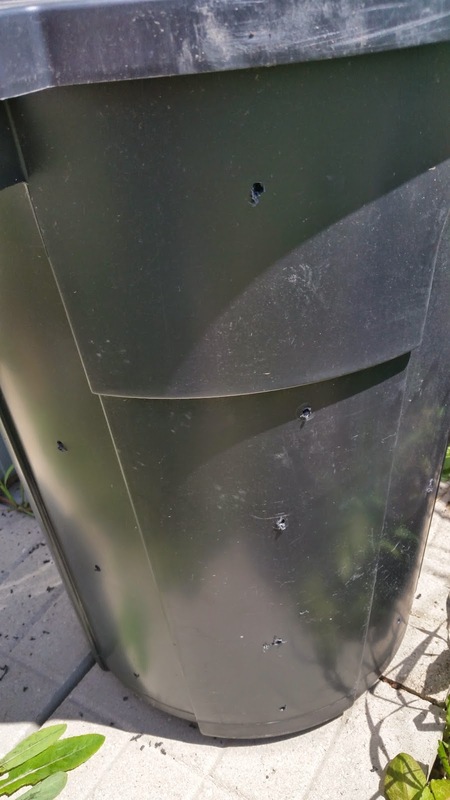 In this case, a 32 gallon or larger trash can with a lid that snaps closed and a cordless drill with a drill bit attached. 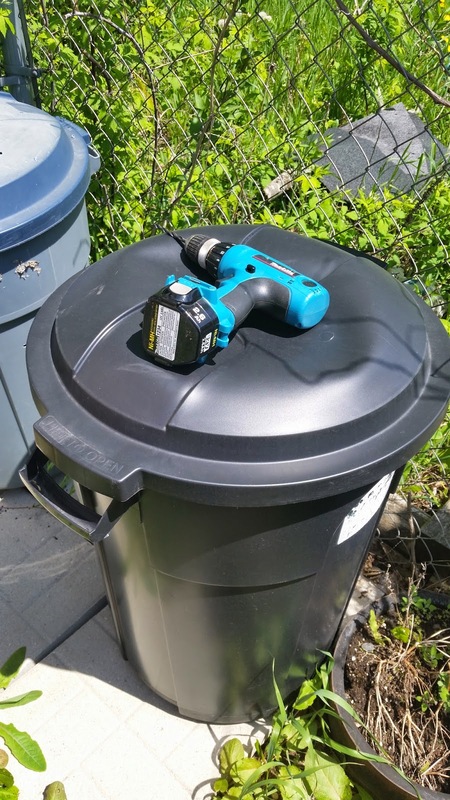 Step 2: Using your drill, drill holes into the lid of your trash can. These serve multiple purposes. To properly get your compost composting, you need to have air and moisture. Having the holes in the top allows rainwater to drip in and for air to circulate. Step 3: Flip your trash can over and drill holes into the bottom. Again, this helps with air circulation, but it also serves the opposite purpose of the top holes. It allows for excess water to drain out the bottom. Step 4: Continue your drilling by adding holes all around the trash can itself. Be careful that you don't drill so many that you ruin the structural integrity of your container. After all, you want this to hold soil, not break open and dump who knows what all over the place! 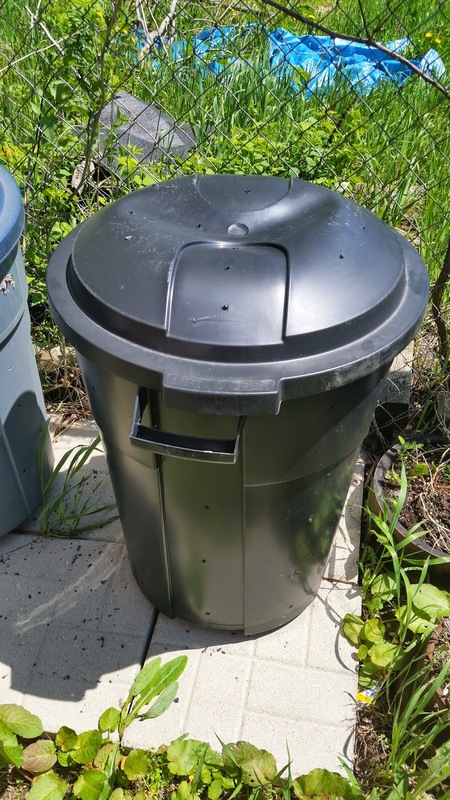 Step 5: Find a location for your brand new composter! You have a couple of options. What's shown in this photo is actually not a recommended one! It doesn't allow for air circulation or drainage. If you'd like worms to find their way into your trash can (and this is a good thing! Worms make great compost helpers! ), place your new composter onto a patch of soil. This will allow them to wriggle their way up through your drainage holes and to start munching away at all the worm goodies that you'll be putting into your compster. 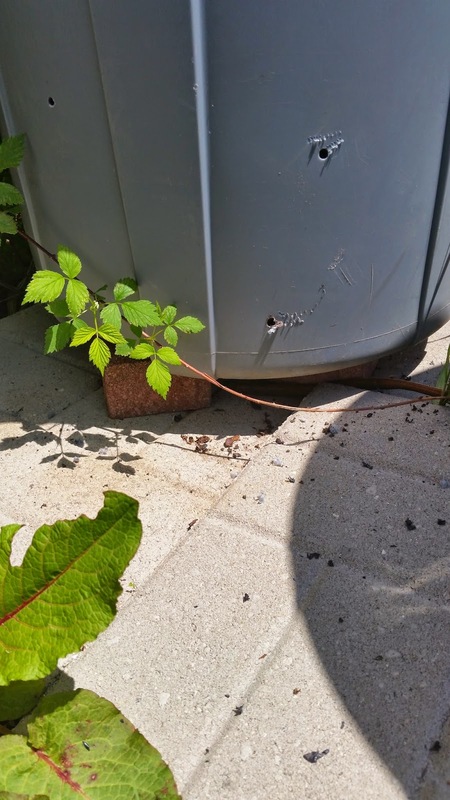 Step 5 continued: Your other option is to place your composter up on something like bricks. This is actually my original composter. It's almost halfway full of some seriously great looking dirt. Once it's full, I'll be switching over to my brand new one. This gives me a chance to pop into the store (or look around) for a few bricks. 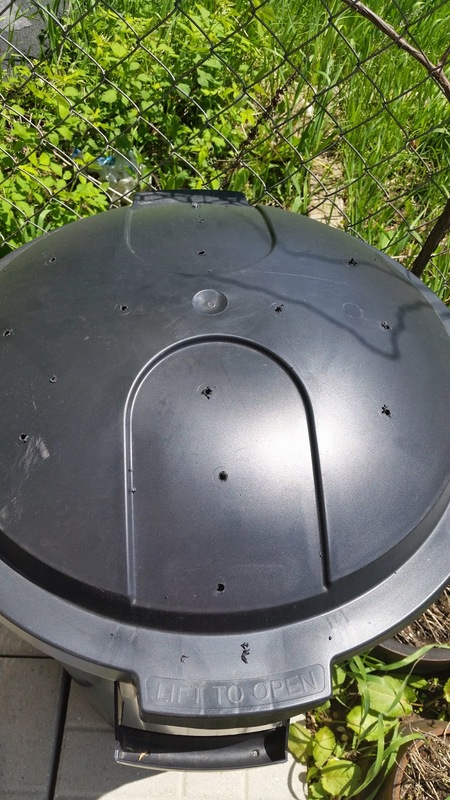 Having the composter raised allows for drainage and for proper air circulation. It doesn't allow for our friends the worms to climb up in, though. So, if you want some worm help, you have a couple of options. You can buy some or you can do what I've done and as you spot them in your yard, pick up the little wrigglers and move them into your composter. Once you have the structure built, you're ready to get started! For my composter, I added a bag of old topsoil, a bit of water and then started adding the "gunk." What defines gunk? Gunk includes fruit and veggie scraps, produce that's past it's prime and yard debris such as grass and leaves. Things that you don't want to include? Meat and dairy products because as they break down, they stink! Not only do they stink, but that smell is much more likely to call critters that you don't want hanging about. You also don't want to add in things like sticks because they don't really break down in this sort of composter. A couple of quick tips: Compost does best when it's rotated to get a good mix. You have a couple of options for this. 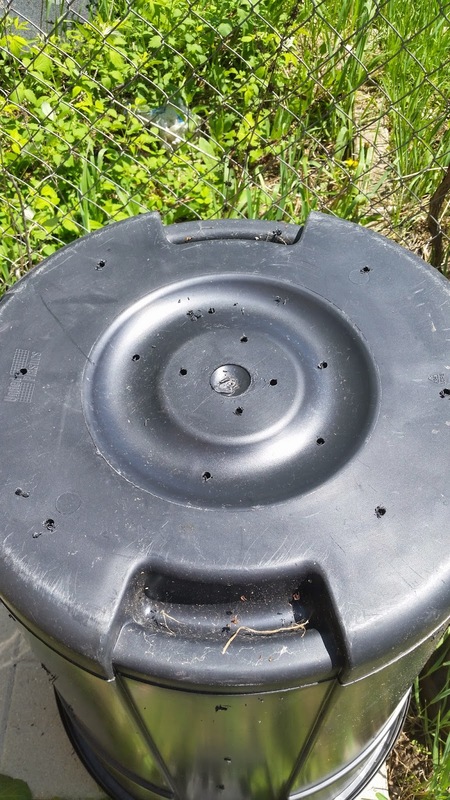 If your lid snaps down firmly and won't come off, take your bin, lay it on its side and roll it around a few times every couple of weeks and then put it back in place. If this won't work for you, do what I do..whenever I add something new, I take a shovel and mix it all up. Also, if you can, chop whatever you're tossing in there into small pieces. This will decrease the amount of time that it takes for it to break down. Again, I've found my shovel is really useful for this, especially when I don't want to touch that science project veggie that I found hiding in the back of the fridge! With any luck and a little patience, you'll have some great soil for your garden beds, flower beds or containers!